enduring character and great value. For more than 60 years in the Valley, the Bonadelle family has built thousands of beautiful new residences that owners are proud to call “Home Sweet Home.” A home built by Bonadelle Neighborhoods is one that is built to be uniquely yours—a custom-quality, ecologically friendly home with luxurious features, superb craftsmanship, exceptional attention to detail and standard amenities that many other homebuilders would consider upgrades. The much-loved local homebuilder that’s been “Building Value for Generations” is about to bring its legacy of excellence to Riverstone’s Town Center District. Harvest at Riverstone from Bonadelle Neighborhoods is a limited collection of two-story, single-family homes designed for a lifetime of memories. The smart, energy-efficient interiors will offer open floorplans, abundant natural light and kitchens of every home chef’s dreams. 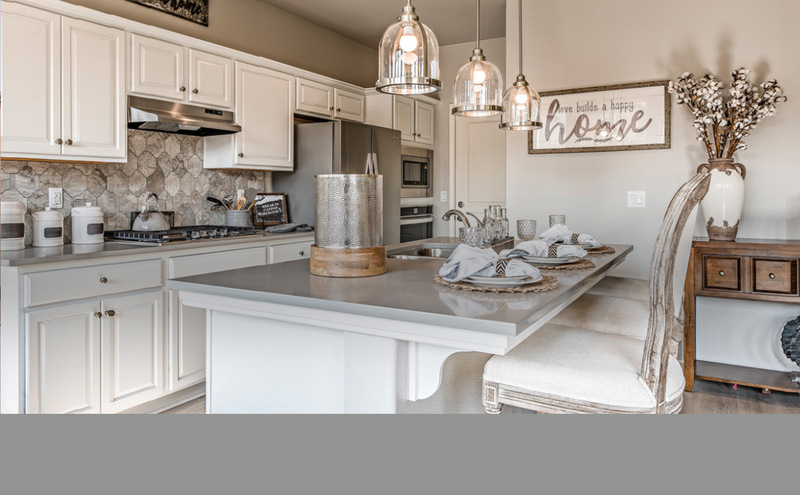 Legacy Series homes also boast balconies, covered patios, wrought iron staircases and breakfast bars with sinks. A great starter home that’s big on style, innovation and unique features, the 3-bed, 2.5-bath, 1,209 square-foot Lineage is available in your choice of Cottage, Spanish or Tuscan architectural vernaculars. With three bedrooms, two-and-a-half baths and a two-car garage, the 1,398 square-foot Tradition is as comfortable as it is beautiful. Exteriors in your choice of Cottage, Spanish or Tuscan complement the stylish design sense. Offering 1,512 square feet of living space, the 3-bed, 2.5-bath Generation is ideal for today’s generations of growing families. Stylish interiors meet gorgeous exteriors, available in your choice of Monterey, Spanish or Tuscan. Presenting 1,579 square feet of living space in either Monterey, Spanish or Tuscan architectural styles, the 3-bed, 2.5-bath Palmina also offers a media desk with linen cabinets and a two-car garage with a storage room.